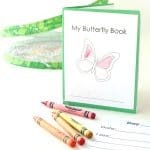 Here’s a way to celebrate spring with a butterfly craft for preschoolers. 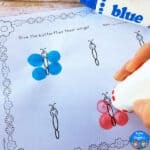 It uses a simple technique that kids love – painting on coffee filters with watercolors! 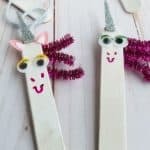 I’ll share a few tricks for setting this craft up and making it extra fun. 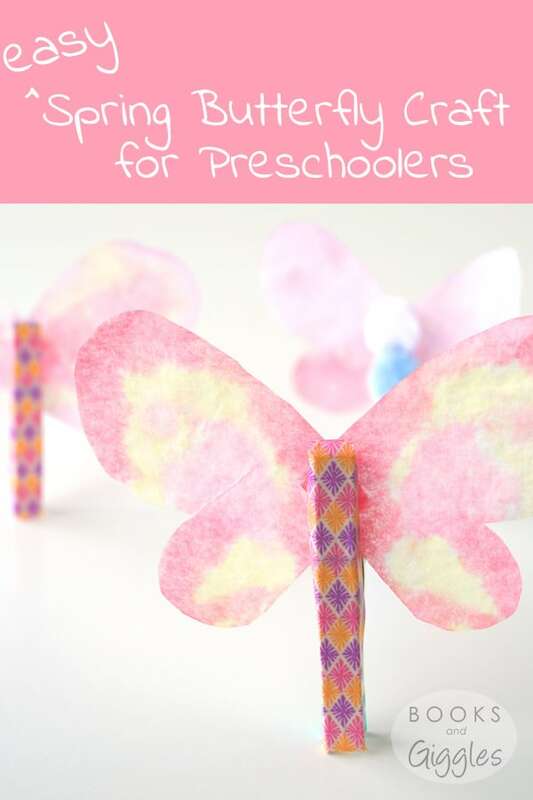 You’ll be cutting up coffee filters to make the butterfly wings. I’m probably over-explaining this step – it’s simple, but seems to take a lot of photos to be clear…. Start by folding the filter into eights. 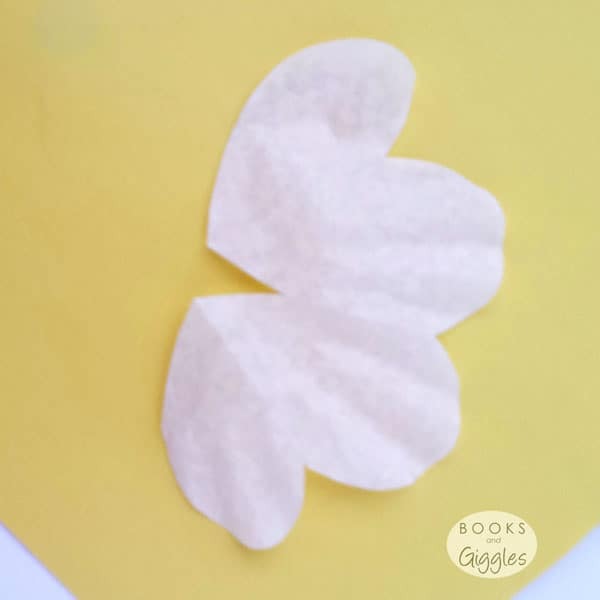 Then cut out a half heart shape, using the edge that is completely folded as the center of the heart. For the outside edge, do not completely cut off the fold. Leave a little bit so the hearts stay connected. Next, cut apart so you have two double hearts. Fold the double hearts back together. 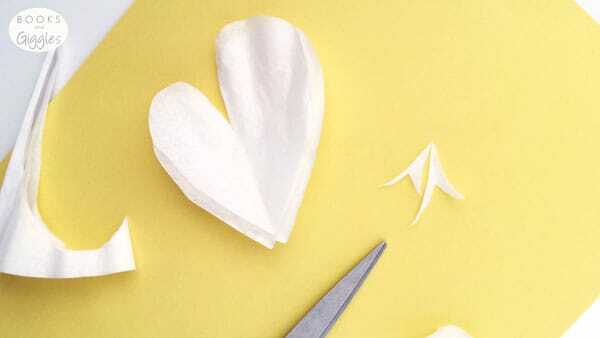 Trim one lobe of the heart to make it lopsided. Unlike the picture below, don’t cut off the fold holding the hearts together. Keeping them together will make it easier for your child to handle. Now you’re ready to set up the painting area. Set out small containers of liquid watercolors. I use homemade ones, but you could also use store bought ones. In a pinch, you could also use the dried type, but they won’t be as vibrant. To keep kids from mixing up colors, provide one cheap paintbrush per color. 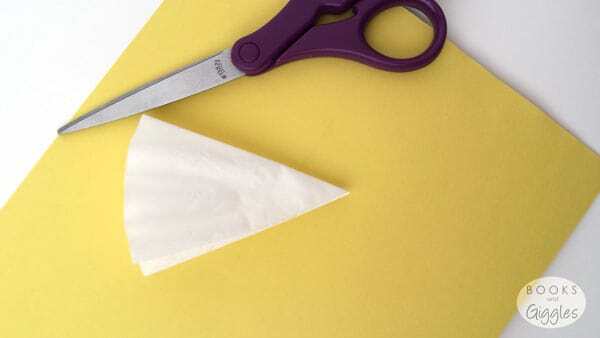 Lay out a doubled over paper towel as a painting surface. 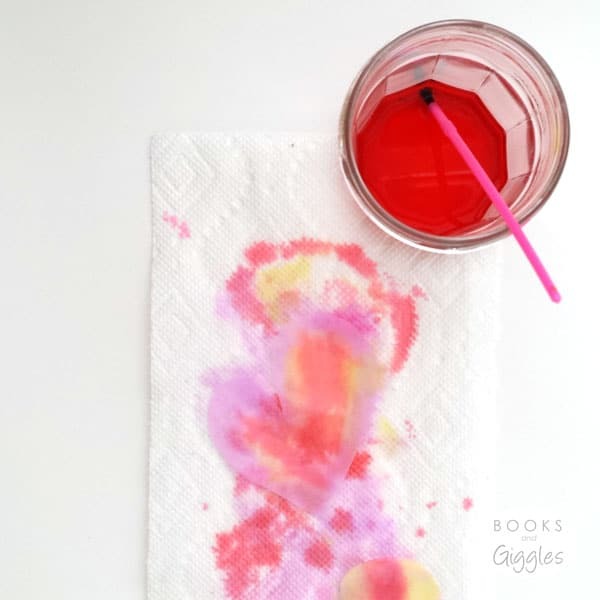 Paint the coffee filter with the watercolors. Use enough paint that it absorbs through both layers. That way the pattern will be symmetrical on both butterfly wings. Allow the filter to dry. Meanwhile, decorate a clothespin. 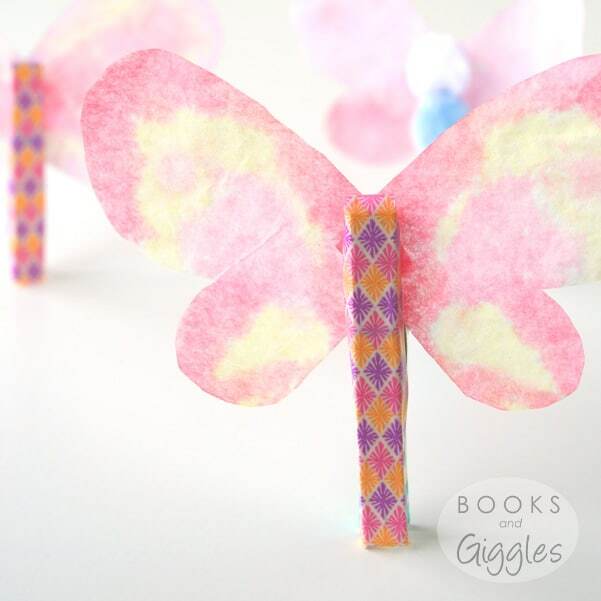 You can cover it with washi tape (don’t wrap over the end of the clothes pin – it will stand up better bare). Or, glue pompoms to it. 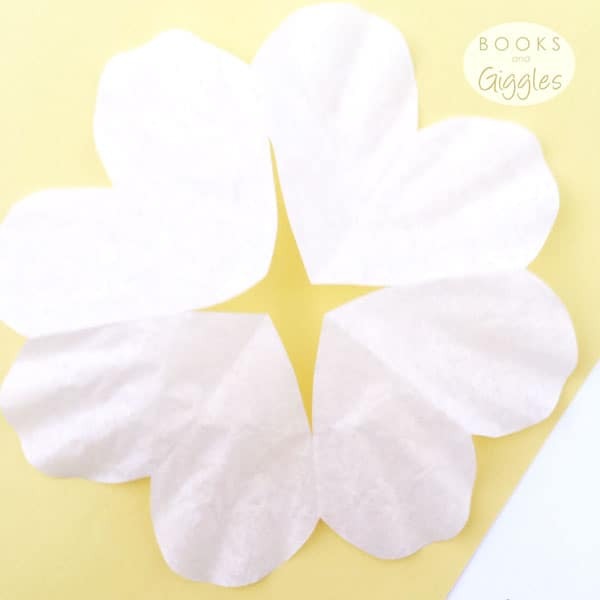 When the coffee filters are dry, separate the lopsided hearts. 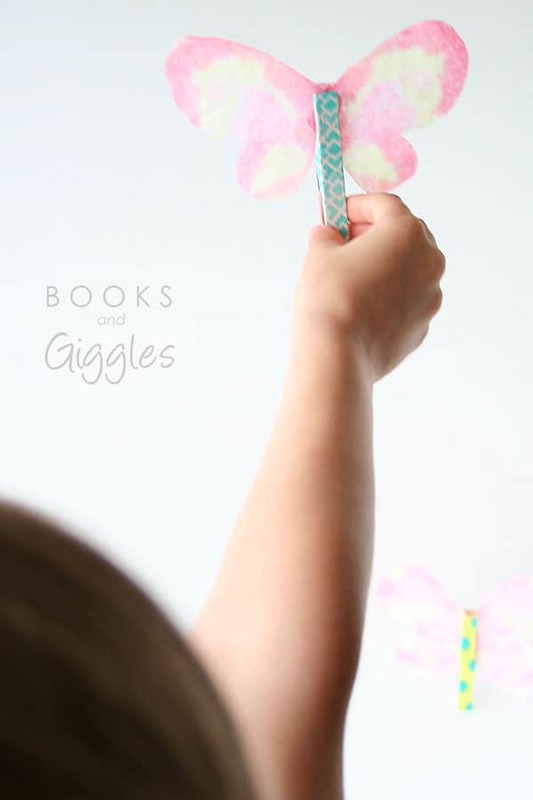 Then, flip one so that the two together resemble butterfly wings. 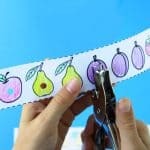 Clip them together with the clothespin. You may want to glue the wings to the clothespin. 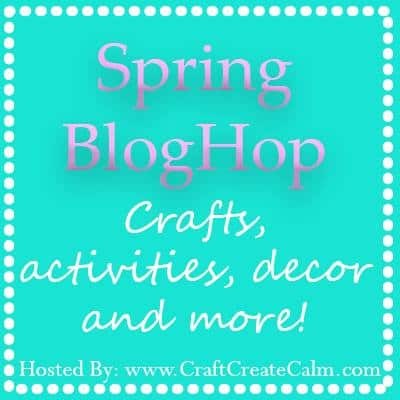 This post is part of a Spring Blog Hop. 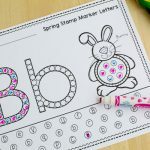 For more crafts, activities, and decor, you may like to check it out!